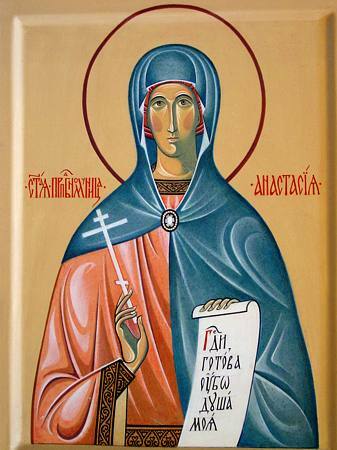 The Monastic Martyress Anastasia the Roman in infancy lost her parents, and she was then taken under the care of the head of a women's monastery, named Sophia. The hegumeness raised Anastasia in fervent faith, in the fear of God and obedience. During these times there began the persecution against Christians by the emperor Decius (249-251). The city administrator, Probus, on the orders of the emperor commanded that Anastasia be brought to him. Having been blessed by her eldress-mentor for the deed of suffering for the Name of Christ, the young Martyress Anastasia humbly came out to meet the armed soldiers. Seeing her youth and beauty, Probus at first attempted by false flattery to tempt her and lead her into a renunciation of faith in Christ: "Why waste thine years, deprived of pleasure? What is there to gain in giving thyself over to tortures and death for the Crucified? Worship our gods, get thyself some handsome husband, and live in glory and honour". The saint steadfastly replied: "My Bridegroom, my riches, my life and my happiness – is my Lord Jesus Christ, and with the threat of torments thou canst not part me from the Lord!" Fiercesome tortures were then begun. The holy martyress bravely endured them, glorifying and praising the Lord. In anger the torturers cut out her tongue. The people, seeing the inhuman and disgusting treatment of the saint, became indignant, and the governor of the city was compelled to bring the torture to a close, by beheading the martyress. The body of Saint Anastasia was thrown out beyond the city for devouring by wild animals, but the Lord did not permit that a mockery should be made with the holy remains. Learning of this through the Lord, the hegumeness Sophia found the torn body of the martyress, and with the help of two Christians she consigned it to earth.